Very nice job! I love the wainscoting, the telephone nook, the floor, the cabinets and the lighting. So nice that she recreated a ’30s look instead of trying for “Tuscany” or something like that. What are the knobs on the island? It does look like a gorgeous old fashioned kitchen. I like the laundry area. Well done. I LOOOOOOVE this kitchen! So cozy and warm and retro. I would want to spend lots of time in here. It is really lovely. Nice job, Candice! Enjoy the beautiful space you created! Adorable! I love the kitchen and the simplicity of the black and white. My favorite of all, it has so much character and is so functional. I would love to have this kitchen in my home. 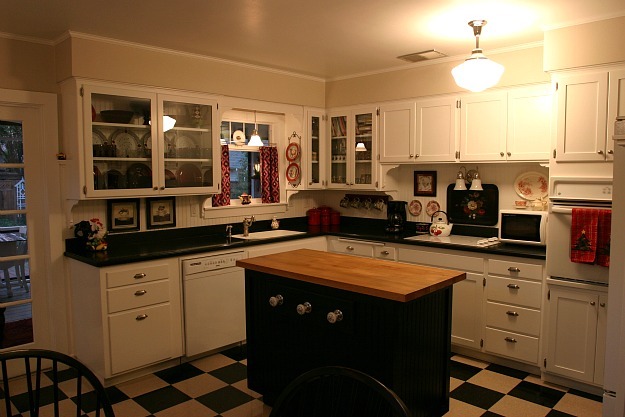 This kitchen rocks….. Love the heart warming nostalgia that absolutely takes you back to a simpler, gentler time. All the features completely compliment each other to create an incredible kitchen. Truly unique in so many ways. Well done. I agree Colleen, this is my favorite kitchen of all. Love the black and white with pops of color. Looks very warm and inviting, with a clean, functional vibe. Perfect! I want to know what the knobs on the island are for too. What a quaint nod to the house’s origin. Adorable. 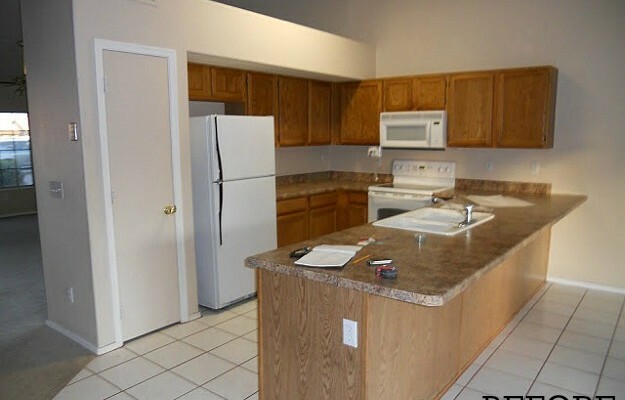 What a cute kitchen. It reminds me of a quaint cafe in Paris. Wow! This feels so right! Authentic, yet current. Comfy, Homey. Lovely! We are building new and I worry that our place won’t look or feel right. You got it perfectly! I love a little something about each of the before and after kitchens featured this week, but yours does have an old-fashioned, homey feel to it that comes across beautifully in the pictures. Well done! Wow, they did a beautiful job on this. So inviting and welcoming. I would love to cook in this kitchen! I have to say that I am really impressed with the laundry nook! 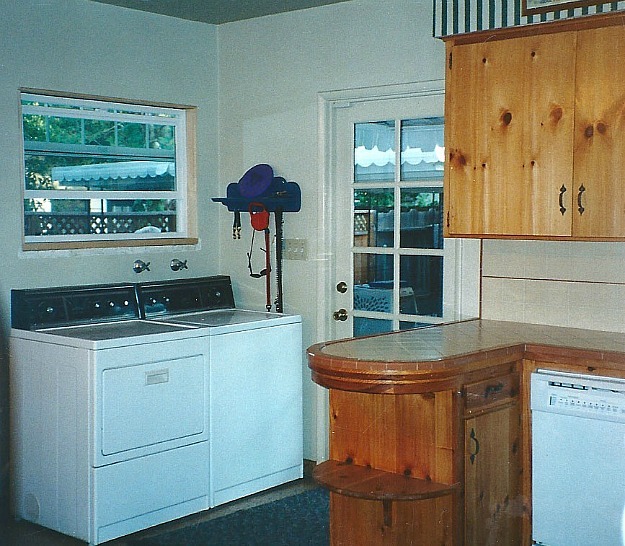 It’s always tough to have a laundry area in the kitchen, but this one looks adorable and it fits right in! Great job! All of the kitchens are beautiful. But there is something about this one that I LOVE! The charm….love the teapots, love the windows, everything. What are those knobs?? LOVE this kitchen! So homey and charming, and the telephone nook is darling! I think this is my favorite make-over so far. How charming! Wow…and I thought I was the only one with a wash machine and dryer in my kitchen! Hoping to do a remodel in the a couple of years and reclaim all of my kitchen. The current situation is the result of my in-law’s moving into an old farm house where the ringer machine was in the crusty old basement. I don’t comment here very often, purely because I’m lazy, not because I don’t find lots of homes shown here to be beautiful, but this one time I feel compelled to actually comment – this is absolutely ADORABLE. This is one of my favorite kitchens I’ve seen. Very, very good job! I wish I could do this to mine. Brilliant. Really nice job making a functional, style-appropriate space for your family! I’d love to sit at that breakfast nook with my coffee and the curtains drawn open in the morning. Fabulous job. You did it all just right. True to the period and very, very charming. Your kitchen reminds me of my Aunt’s kitchen and the good smells and happy times there. May yours make the same memories. What a fun and charming kitchen! This is the kind of design I would want in a country or farm house. I love the refresh and that they kept with the character of their house. Well done. Thanks so much, everyone, for all the nice comments – you really made my day! The knobs you see on the island are old doorknobs. I originally planned to use them to hang hand towels on, but I’ve found they are much more useful for hanging laundry on as it comes out of the dryer! I don’t know if this one is my favorite — they’re all so great it’s hard to choose. But this one would perfectly suit the period and style of my own 1935 house. I love the attention to detail. My kitchen doesn’t look TOO dated yet (last remodel was in the late 90s), but once it does I’m going to steal some of these ideas! Love. Absolutely love. It’s so inviting. I want my kitchen to look exactly like that. Beautiful!!! 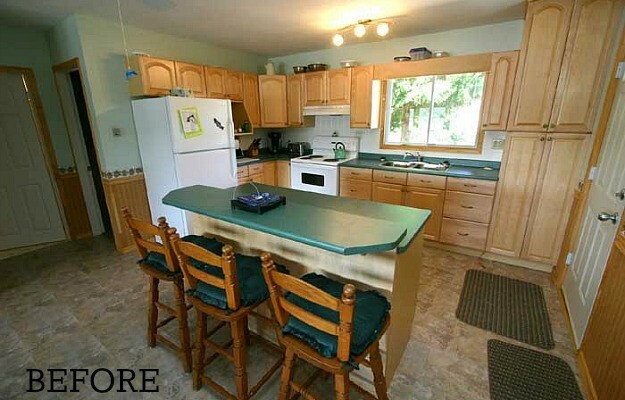 Is that soapstone for the countertop?? Julia: I think you’ve tapped into something important in this series of showcasing real kitchen makeovers. Many of us got tricked into the long-paraded HGTV mantra: “open concept floor plan, granite countertops and stainless steel appliances.” It’s such hokem, proven perfectly by this series that kitchens have character only when their owners do a makeover that suits the house, their tastes, their budget, and not some magic formula that television thinks is right. I love each and every one of this makeovers. So thought out. That could be my parent’s kitchen. My sister owns the house now. I think I will send her a link to show her the possibilities. Just painting over the knotty pine would be an improvement. Tricia mentioned the teapots and I had to go back and look at them again. Those and the print chosen for the cafe curtains just give me the warm fuzzies. All this charm and beauty and most of it accomplished with a can of paint. Wow! Just to clarify, I didn’t mean to imply that those who DO have granite, etc., have fallen into any trap. I have all of the above myself!! I only meant that it is wonderful when homeowners are excited to share their visions here that don’t match TV’s expectations. I trust I didn’t hurt anyone’s feelings. And I will “third” her post as well! Granted, open concept, granite countertops and stainless steel appliances have their PLACE – not every place is it! This is certainly not one of them, and what you have done here is marvelous! My house is not any particular “style” – just a mid-60’s “blah” plain jane that has no warmth or coziness to it. I can do anything I like with it and be fine, and I am loving on this! Not that I am going to copycat you, mind you – just take some of these concepts and ideas, and apply them where they work here. 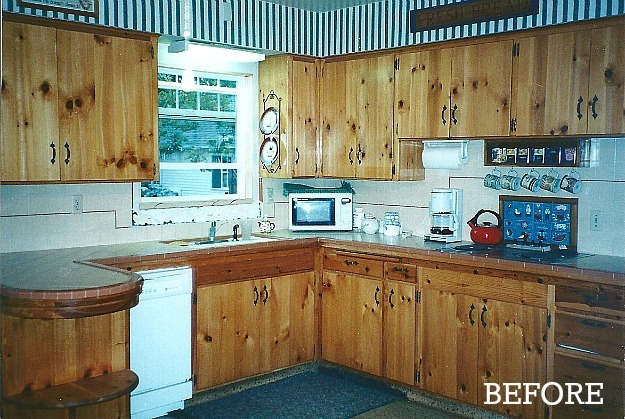 Oh – and I hope those pretty knotty-pine cabinets went to someone who’s redoing a mid-Century Mod kitchen? They’d be perfect there! That is one adorable kitchen, and it looks wonderfully functional too. I imagine it is a place where anyone entering it would relax immediately and feel at home. What more could you ask? Love, love, love this kitchen! Let me echo the comment above from @65andcounting. I really enjoy the variety and all the different surfaces and ideas. 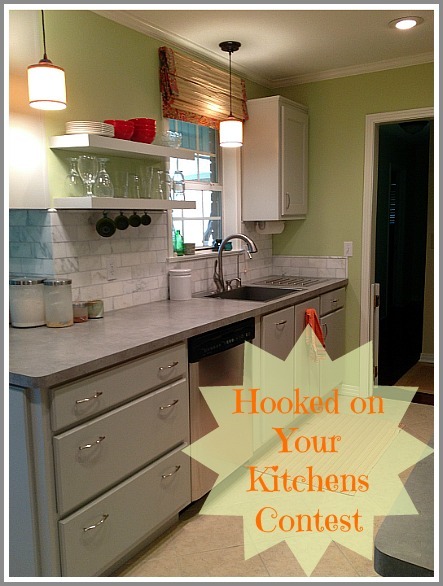 Because of these posts I am seriously considering white cabinets which I never would have before. And I am DIGGING those black countertops. Too cool. Terrific job of updating and still keeping the integrity of a 30’s house! Great job, Candice! I love this kitchen! My great-grandmother had a 1930s kitchen with a telephone nook just like Candice’s. I love it. And I also second, what 65andCounting says. My husband and I laugh every time we watch HGTV and everything is about stainless steel, granite and open concept. Although those are wonderful design concepts, they are not the ONLY designs possible. So wonderful! But I have to say when I saw the phone nook in the wall….*swoon*! Wish home builders still made those, I never see them anymore. Love it!! So cute and charming! Love every detail. 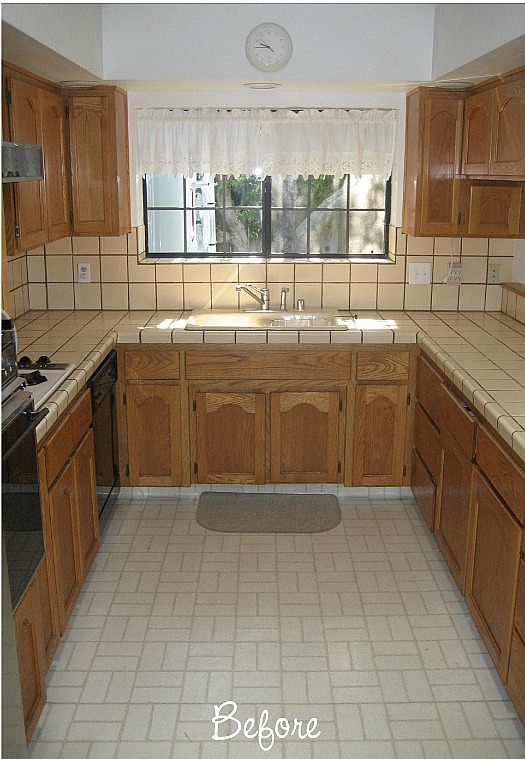 Great job with your kitchen…Looks really great, all the details are awesome but I extremely like your choise of color. I’ve believed that black and white is not the best color for a kitchen, but you really changed my mind. Congrats. Love it. Charming, warm, yet modern and clean looking. Love how the laundry nook is incorporated but more subtle now. Great retro remodel. When I see pictures like these I think I should just change the flooring to black and white check (which is definitely what I would pick) and call it a day! What type of flooring is it? Love your woodwork details!!! Anne – The floor is VCT (vinyl composition tile). Super cheap and tough as nails. Comes in lots of colors and can be installed in patterns, borders, etc. Ours has held up really well against a lot of foot traffic, kids, dogs, etc. I would definitely use it again in an older home. I have no idea what was going on in my life where I missed this kitchen. Wow! Just wow! I love it. 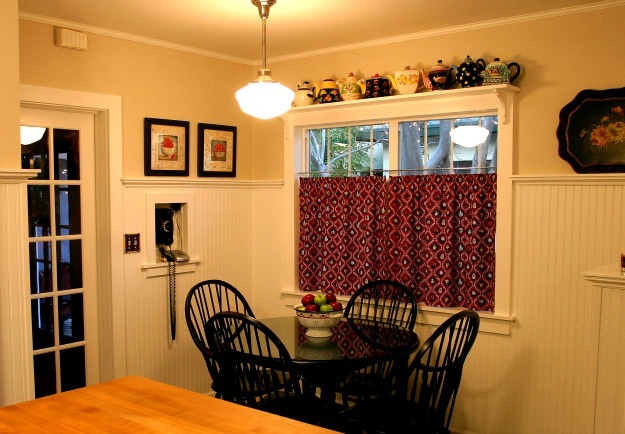 I love the wainscoting, the telephone nook, the floor, the cabinets and the lighting and the teapot collection. I love every detail and have I said that I love this enough! It is just so cozy and warm and authentic. It’s so nice that you recreated a ’30’s look. I would so enjoy cooking in here. I probably would have seen the laundry being in the kitchen as a problem, but you’ve solved that issue nicely. Gosh I wonder if we could see the rest of your beautiful home….So inspiring and exquisite. Thank you for sharing. These photos were taken in 2005 when our house was on a home tour to raise funds for the high school in our neighborhood. It’s changed a bit since then, but I hope you enjoy the slide show. I just saw this as I didn’t think anyone ever responded. Thank you for the link and lovely home. I’ve never spent much time in your neck-of-the-woods, just usually passing through on the way to Yosemite. Thank you again Candice. Oh, Candice, your kitchen is adorable! Your vision is inspirational. 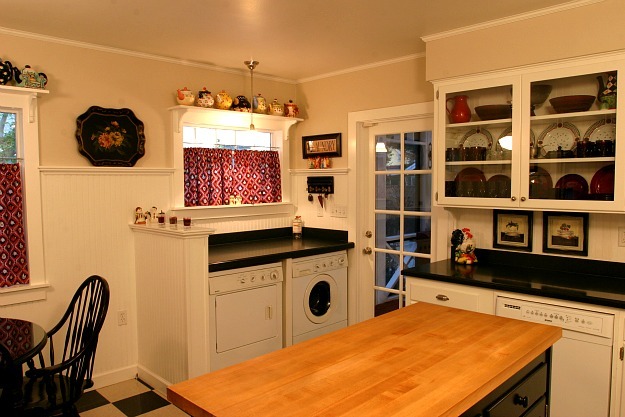 Love the white, the glass fronts, the wood counter top on the island, the beadboard….sooo homey. We just bought a house that was built in the ’40’s and though the kitchen has had some updating, the laundry does share that space. You’ve included your laundry beautifully as an element in this family gathering/work space. Your kitchen remodel is my favorite! Thanks, Pam! Initially I wanted to move the laundry out of the kitchen, but after living with it there for a few months I found it to be so convenient I decided to leave it there. The counter over the top is a great space for folding clothes. This is the sweetest most charming kitchen, ever! Candice, do you have a blog, if you don’t, you should. Could you share the paint colors of the walls and cabinets. 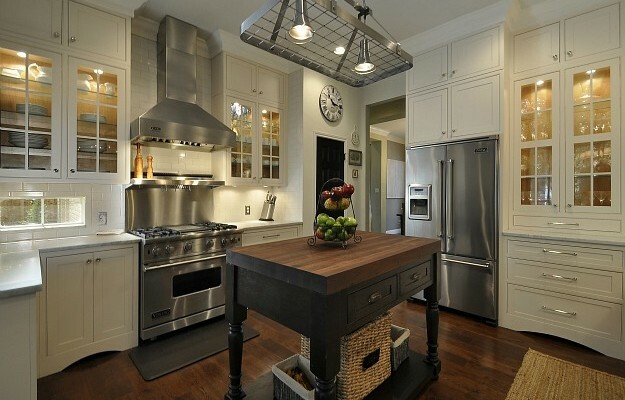 I wish I had more up-close pictures, just love this kitchen!